ehavior may be sought through analysis of a chaotic mathematical model, or through analytical techniques such as recurrence plots and Poincare maps. In common usage, "chaos" means "a state of disorder". However, in chaos theory, the term is defined more precisely. 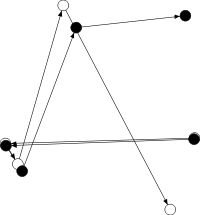 Although there is no universally accepted mathematical definition of chaos, a commonly used definition says that, for a dynamical system to be classified as chaotic, it must have the following properties: it must be sensitive to initial conditions; it must be topologically mixing; and its periodic orbits must be dense. The requirement for sensitive dependence on initial conditions implies that there is a set of initial conditions of positive measure which do not converge to a cycle of any length. Sensitivity to initial conditions Sensitivity to initial conditions means that each point in such a system is arbitrarily closely approximated by other points with significantly different future trajectories. Thus, an arbitrarily small perturbation of the current trajectory may lead to significantly different future behaviour. However, it has been shown that the last two properties in the list above actually imply sensitivity to initial conditions and if attention is restricted to intervals, the second property implies the other two (an alternative, and in general weaker, definition of chaos uses only the first two properties in the above list). It is interesting that the most practically significant condition, that of sensitivity to initial conditions, is actually redundant in the definition, being implied by two (or for intervals, one) purely topological conditions, which are therefore of greater interest to mathematicians. Sensitivity to initial conditions is popularly known as the "butterfly effect", so called because of the title of a paper given by Edward Lorenz in 1972 to the American Association for the Advancement of Science in Washington, D.C. entitled Predictability: Does the Flap of a Butterfly’s Wings in Brazil set off a Tornado in Texas? The flapping wing represents a small change in the initial condition of the system, which causes a chain of events leading to large-scale phenomena. Had the butterfly not flapped its wings, the trajectory of the system might have been vastly different.